Caption Slip reads: "Photographer:Swaim. Date: 1957-11-11. Reporter: Swaim. Assignment: School Burglary. 7,8: Don Harding, left, Pasadena Police criminalist, print dusting damaged, door, and Patrolman Mike Turkington taking notes on futile burglary of John Muir High School. 17: Don Harding, criminalist, left, and Asst. Principal Charles Bowen examining damage done by custodian in brekaing out of closet where he was locked by burglars. 18: Asst. 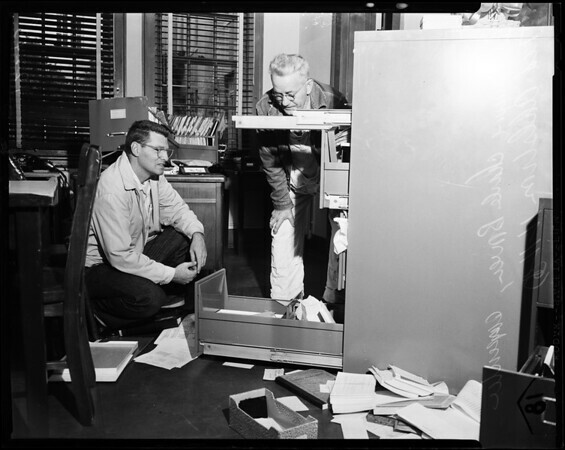 Principal Charles Bowen and carpenter Ted Ahlstrom looking at damaged files and scattered records in one of several offices ransacked."